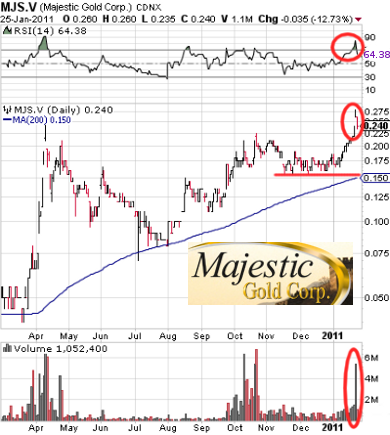 Tuesday was maybe a back-to-reality day for the stock of Majestic Gold Corp. (CVE:MJS), (PINK:MJGCF). It put an end to the recent appreciation of the company's shares. A news release from Monday related to Majestic's main project in China allowed MJS to jump the same day by over 17% on the Canadian Venture Exchange (CVE). It appeared, however, that the surge did not last for long. Yesterday, the stock retreated 12%, showing that investor enthusiasm had already dried out. RSI indicator left the overbought area and gave a "sell" signal. Until last session, the company's shares were on the rise, having moved over 33% up since New Year. The positive trend was further strengthened by the announced two days ago encouraging assessment results for the Songjiagou gold property. They revealed quite promising figures, such as: 78.6% internal rate of return, a pay-back in just 1.4 years and total gold production of over 2.3M ounces for the life-of-mine period. This immediately caught investors' attention and the stock jumped up, setting a 3-year price record on a really huge turnover beating eight times the usual volume. In spite of yesterday's pull-back, the price of MJS remains well above its 200-day moving average. The future performance of the shares is not easy to guess. If we rely on the latest filed financial reports for the Q2 of 2010, we might suppose that a more lasting appreciation of the stock seems unlikely. Does the company really have sufficient funds to maintain its mineral interests and continue with its exploration program? Majestic has not officially announced any private placement financing in the recent weeks. Maybe this is what the corporation's managers have to do in the near future. Probably a negative factor is the price of gold that has been declining since New Year. Besides, the current market value of the company is about $120M, while the net tangible worth of the business is $12.5M. This huge discrepancy suggests that the market capitalization of Majestic Gold is overvalued.